You can treat your dog at home for allergies, but the treatment you use will depend on your pet's allergy and its severity. 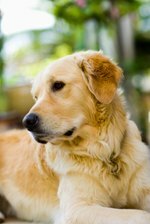 An allergy is your dog's immune system overreacting to an external cause. Environmental and food allergies are the two most common types, and a process of elimination can help determine what's affecting your dog and the remedy. Outdoor seasonal allergies from ragweed, pollen, trees and mold are most common. But your pet can also suffer from indoor causes such as home cleaners, chemicals, dust mites and even plastic food bowls. If your dog's symptoms appear seasonally, it's most likely he's bothered by outdoor irritants. But if his issues are year-round, consider indoor causes. Your dog can exhibit respiratory symptoms such as a runny nose, watery eyes or coughing if seasonal outdoor allergies bother him. But he may also become itchy and scratch constantly. If your dog has any severe reaction to an allergy such as a rash, vomiting or diarrhea, see your vet before treating him. Feed your dog an acidophilus supplement to create good bacteria in his system that combat allergies. Acidophilus can be found in pill form or in yogurt. Evening primrose oil, coconut oil or omega-3 fatty acid supplements work as anti-inflammatory agents to ease itching. Administer an oatmeal bath if your dog is itchy or has red skin. Mix baby oatmeal or regular finely ground oatmeal in a warm bath and let your dog soak. Pour the water from the bath over his body to soothe the itch. Make some chamomile tea and chill it in the refrigerator to help relieve itching. Put the tea in a spray bottle and spritz your dog's skin for quick relief. A dog with a food allergy can exhibit similar symptoms to environmental allergies -- itching, scratching and skin irritation. Food allergies are genetic and can only be isolated by eliminating the specific allergen from the dog's diet. Common irritants in a dog's food include beef, dairy products, chicken, lamb, fish, chicken eggs, corn, wheat and soy. Blood tests can be performed by your veterinarian but may not be accurate. Isolate a food allergy by changing your dog's food to one with a protein and carbohydrate source he has not eaten previously. Choose a limited ingredient food if possible and feed it for 12 weeks. Eliminate treats, chews, rawhide and anything not included in the diet.